Jessica Rocha was very frustrated with her children’s’ behavior (one being her fiancé’s daughter). They were stealing and bullying at school. Jessica had tried a variety of punishments including grounding, taking away sports, toys and privileges, but nothing seemed to be working. 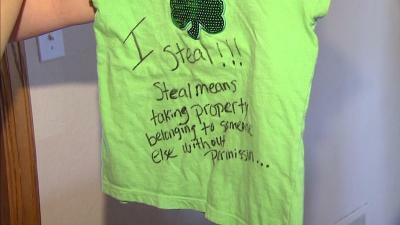 In her continued struggle to correct her children, she decided to make a t-shirt describing the child’s actions. The shirt read, “I steal!!! Steal means taking property belonging to someone else without permission..." and the back read, "I steal...Please watch me." Jessica was also planning a “bully” t-shirt for her son. While the school did not approve of the t-shirt and made the daughter covered it up, Jessica Rocha said that the shirt worked and her fiancé’s daughter stopped stealing after one day of wearing it (Yahoo). Are our spiritual “t-shirts” washed and clean?